No, no, no, not tent, I said tint! 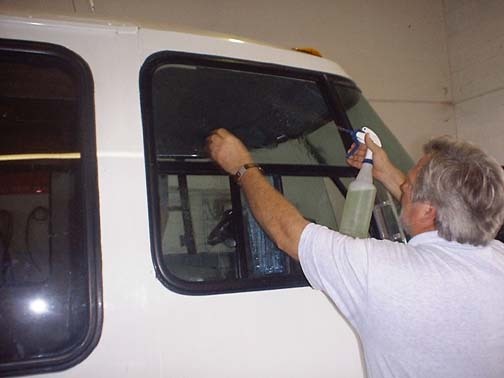 People that have window film on their coach will tell you this option is nothing like those stick on key protectors or the miracle oil additive that is reported to give you twice the mileage, make your teeth brighter and attract a girlfriend that likes to go fishing, no window tint will truly make your life better. There are several types of film, reasons to have it as well as a great gap in quality both in the film itself and in the installation technique. Before we get started with the hands on tint installation, lets talk about some tint basics. My Mother is a college librarian, been one for and one thing I walked away with from her was that when explaining something I should fully describe all aspects of the subject so be careful when you ask me a question, I may answer you! Film Types: There are 2 basic types of film. 1. Filter film This film absorbs the heat and will not allow it to reach the interior. It does this using a dye applied to the clear film. The darker the film, the more heat it will filter but it also filters light. 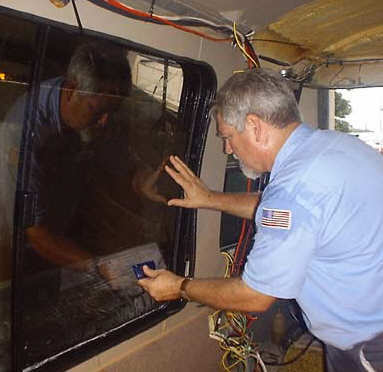 “Limo tint” or 5% film allows only 5% of the perceived light to reach the interior of the vehicle, it also will stop @ 30-40% of the heat at the same time. This is all well and good but in doing this, it also heats up the glass and greatly reduces you visibility. Another problem with this sort of film is that the sun’s Ultra violet (UV) fades out the colors in the dye of the film and you end up with purple or pink windows in time. If you want dark, you need to use a filter film, but if you are looking for heat rejection you can see why this film will create as many problems while dropping the heat. 2. Reflective film Now don’t think of that mirror looking stuff on the high rise building downtown, that is reflective film but that is nor automotive style reflective film. First let me explain that this film does its job be rejecting or reflecting the infrared light spectrum and that means it does not absorb the heat but sends it back out away from you, the glass or anything else. This is the most efficient means of getting rid of heat. The chrome film that is used in buildings keeps out the heat (between 90-95%) but does not affect the vision through it. If a building had dark smoke on the glass, the window would shatter every time a hot day came up, for this reflective film is a great thing. On a car the mirrored film could be dangerous possibly blinding motorists near you. This would not do and that stuff is actually illegal for vehicles but the film industry has created films that do not run the guy behind you in a ditch but do offer you the high heat rejection. These films go by many names (metalized, sputtered, performance, etc.) but what those badges mean is that they are designed to greatly reduce heat inside the vehicle without reducing visibility. You may say, “cool”, why doesn’t everyone get this stuff? Well, some folks want to wiggle their nose at the car next to them without the driver getting bent. Some people may be vampires and can’t take the light or maybe they simply don’t want to be seen. That’s OK and if so filter film is for you but if you just hate the heat, get reflective. I will be tinting the windows in Sara’s coach over the next few days and you are welcome to go along with me on the journey. I tell you now, not to persuade you to not take on the job yourself, but tinting is not one of those sports that you can be good at only playing the game once in a while. It take finesse and practice. Over the years I have had several tinting businesses, even had the “Tinting by Sears” concession for a while and I can tell you I’m getting too old to work that hard for a living! 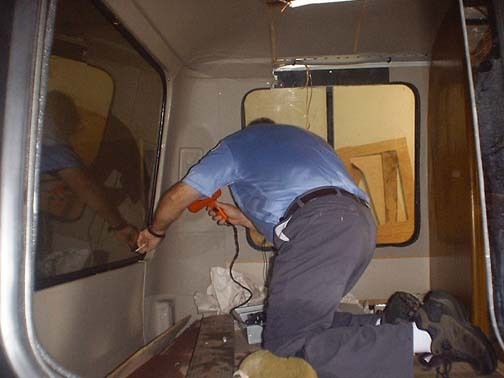 In that I don’t have to do it every day, I don’t mind the work but to make a living at tinting windows you’ve got to be a bit masochistic, young and full of energy, willing to do most anything for a buck or a combination of all three! When you look at a painted picture, some people see a beautiful view while others see a pile of colored brush strokes. The first person is pleased with the finished picture the second is annoyed with the texture of the surface of the canvas and the waste of paint. Window tinting is very much the same way. There are no “perfects” in the inherently imperfect world and if you get close enough or stare at a tinted window long enough you will see a bit of lint, a spec of dust or a grain of sand. The air carries these things along with the good oxygen we breath. It is all but impossible to cut a piece of film the exact size of a piece of glass and place it on the glass without having some sort of foreign matter get in the way. 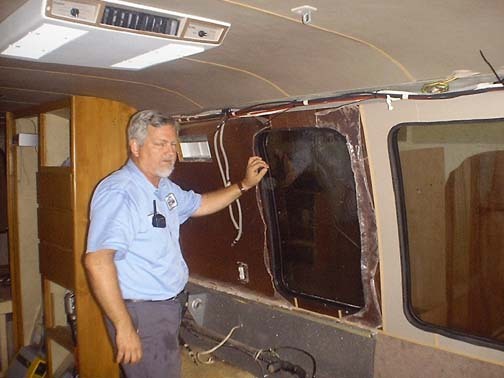 Of course if the speck is the size of Aunt Helen’s bunion there must be something done but if the overall look of the tinted window is clean and the borders are cut smooth and do not detract from the look of the window and frame, you have to say the job is acceptable. Granted there are differences in paintings and I sure would not want my tint job to look like am impressionistic pastel likeness but I think you know what I mean. 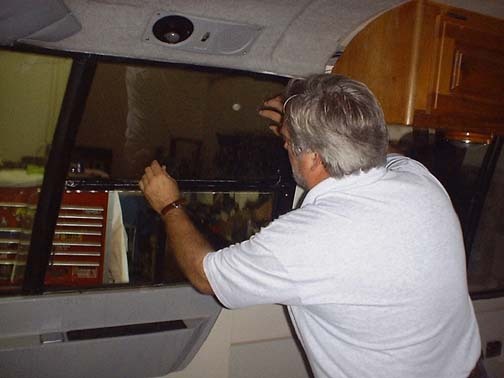 If you follow the system, and there is a system to tinting, the finished window will look clean and quality, but like I said, don’t look too long or too close. Hey, you know what you’ll do now, you’re gonna go out and scrutinize the windows on your Honda! That’s OK, get all of that out of your system now. 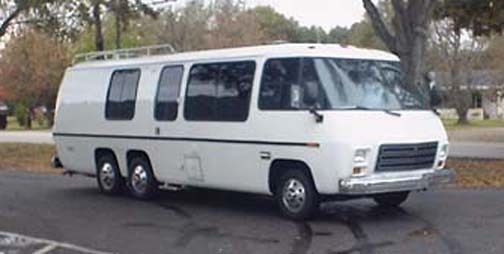 When you’re ready, we’ll start the tint job on Sara’s coach. Tools of the trade are very simple things. First is get good film. There are many good brands (3M, Llumar, Solarguard, etc.). The best way to get good film is to ask a tinting shop what they use and see if they will sell you some. It may cost a bit more but all of the hard work you will be doing will be for nothing if you use cheap film. Next is a breakaway blade razor knife (I use an “Olfa” brand) with stainless steel blades. The patterns must be cut exact and “any ol’ knife will not do, it MUST be very sharp at all times. After that, a spray bottle with “slip solution” (this is water with a couple drops of dish washing liquid, I use Dawn). The slip solution will allow you to position the film on the glass correctly before it sticks. Down the list we have an assortment of plastic squeegees, spreaders and stick tools. These are to help you to push out the slip solution after the film is in place. A hair dryer allows you to dry and heat areas that will not lay down. No, not for your hair, for the film! Of course where there is water, there must be rags to sop it up and you need several clean, soft cloth rags or quality paper towels. You will need to assure the edges are dry to keep capillary action from pulling water and dirt under the film. Finally, you will need a dozen or so new single end razor blades and a good cleaning sponge. The most important word in tinting is CLEAN. Everything must be as clean as you can get it, we will talk about cleaning the glass soon so pay attention! Spray the soapy “slip solution on the glass and take a fresh, sharp razor blade to the glass. This is to dislodge paint, sealant and other really stuck on matter. Use a new blade on each window. A sharp blade will not scratch the glass. Scrub the glass with a sponge. This will work with the slip solution to chemically loosen and clean the glass. Squeegee the surface. This will pull away the material the razor blade and sponge loosened and light dirt suspended in the slip solution. Now you say its clean, not yet! Everything has a static charge and will attract airborne dust particles. As soon as you think the glass is clean, here comes that pesky dust in the air and here we go again. I’m not paranoid on clean but this is the cornerstone of a good tint job! Flush slip solution from the top to the bottom of the glass, this will “short out” the static charge for about 1-2 minutes which is all the time you have to get the film on the glass before the dust attacks. Flush the glass only on the surface that gets the film and only just before you are going to “stick” the film. Remember I said you must have the frame of the glass clean, well when you flush the glass, dirt will flow out do the frame onto the glass if the frame is not very clean so wipe down the frames with a damp cloth and dry them well before you start the glass cleaning process. WOW! Now wasn’t that fun! 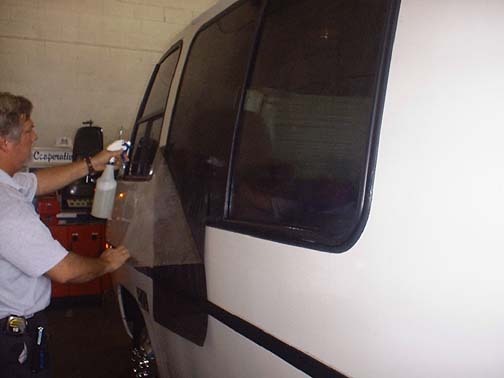 The first step of tinting is cleaning and what an involved step it is. DO NOT cut corners on cleaning, you will not have a good finish if you do, trust me. By the way, the best day for tinting is a rainy day with no wind. The rain helps to short out the static charge in the air as well as flushes airborne dust from the air. You at least need an inside area with dead air (no air movement) to reduce the dust born particles from sticking to the glass or the film. This is why I am sweating so much, its hot in here! 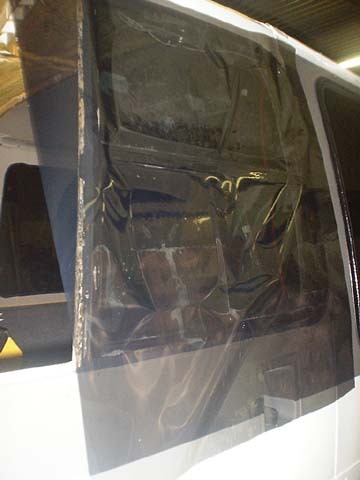 Hats go off to those small tint shops on the side of the road that do their work under a tarp out in the open. They really must be wizards at keeping dirt away from the glass and tine, well maybe they don’t and maybe that’s why their work has more dirt in it! A good time job needs to be done indoors, enough said. Now that your fingers are shriveled up from cleaning all of the windows inside and out, let’s get down to the real fun, cutting patterns. Patterns Open the box of film, measure the width of the window, roll off and cut a section of film at least large enough to total cover the glass. Remember, like your tax form “do not bend, fold or mutilate” the film at any time. The crease or kink you put in the film will stay. So unless you like crease lines in your glass, take care. You must cut a clean edge pattern if you want the finish to look good. 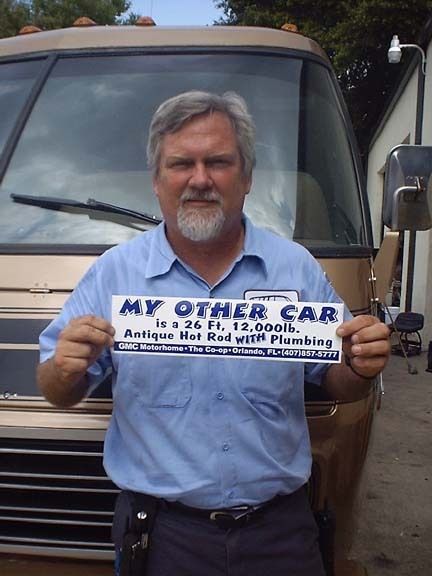 Basically, you are making a “decal” the exact size of the window, not an easy thing to do. 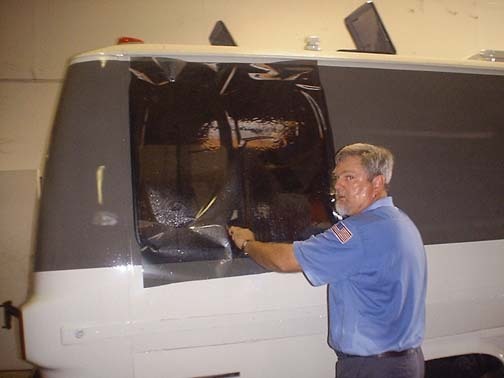 Here is the number 1 question folks ask when watching someone tint a window, “No, the film does not go on the outside”. We do, though, pattern the film on the outside. It’s much easier and more accurate to pattern and cut the film from the outside . Place the film (liner side out) on the window making sure all for the glass is covered. Extra never hurts because the film is cheap compared with having to do the pattern over because your piece of film was too small. Every window, no matter the size, has 4 sides and must be patterned. There are no short cuts here. The pattern must be as close to the edge of the window frame as possible but cannot touch. If the film rides up or even touches the frame or gasket, it will not lay flat and will show. This is a very precise function where no one can be perfect. The pattern needs to have smooth edges, evenly cut along the frame and tight. Nothing is perfect but the cut of the pattern can make the job look pretty close. Peel & Stick Now that the pattern is cut you need to get that film perfectly positioned on the inside of the glass, what fun! Place the pattern (liner out) on a clean flat surface. 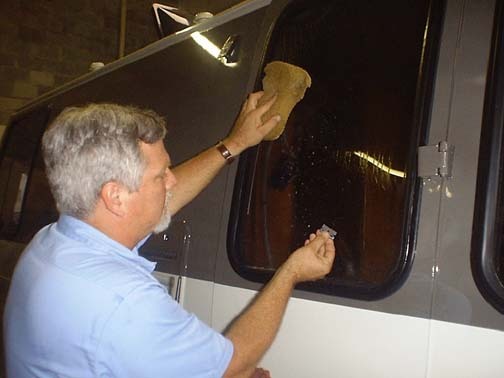 I use the side of the coach of course scrubbed with the sponge (not the razor blade). Peal off the liner while spraying slip solution on the stick surface, this will short out the static charge so you can get the film to the glass without being a dust magnet and keeps the film from folding over and sticking to itself. By the way, this process works great when putting decals like this on your window. Anyway, now just before you peel the liner, you will need to flush the glass where the pattern is going. This is the last clean before the film is applied and remember you have about 1 minute to get the film on the glass before the dust starts moving toward the glass so “get cracking”! You must not let the sticky side of the film touch anything, your fingers, the window gasket – anything! Keep in your mind that dirt is on everything and anything you touch will waste your pattern, so beeeee cooool! Squeegee OK, the film is where you want it, the pattern has fit well, now what? 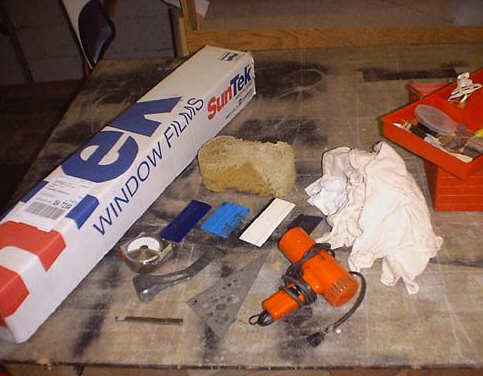 Using one of your squeegee collection, start at the middle of the glass and push the slip solution from under the film which will allow the film to stick to the glass. Be sure the film is where you want it because it’s too late after the water is out. Push out all air bubbles and as much slip solution as you can. The water will dry out in time (3-5 days depending on humidity) but the air bubbles must be dealt with. You may need to use the blow dryer to heat up or stretch the film to get it to lay down. Here I’m heating up the film to get it to stick where I got too close to the gasket. Squeegee out the film once more to remove as much of the slip solution as possible, check the edges to be sure they are flat, then sit back and wait for the fingers. Fingers are small lift areas at the edges of the film where either water, air or both prevent the film from sticking to the glass. These fingers will appear as the film cures to the glass. Don’t worry, you can push them out with a flat spreader or heat it and press it out then. Hey, piece of cake! Now you’ve done one window, a standard floor plan 26′ coach has 17 windows. Don’t look at it that way, think of one at a time and you’ll be OK! It should take @ 30 min. per window to clean, pattern, peal & stick. As I said before, do not cut corners, the quality will suffer. Good luck and if it really drives you nuts, don’t feel bad if you decide to call in a pro. It takes practice to get good at tinting, its ashamed you have only one coach to tint.